The PSP PRO dev team recently suffered a major blow with the loss of ColdBird from the team. 6.20 Pro-B10, 6.35 Pro-B10, 6.39 Pro-B10 and 6.60 Pro-B10 are now available for download. The new Pro LCFW build brings the usual bug fixes like fixing UMD support, fixing problems with PSP Go‘s video mount and improves future compatibility with games and the inferno driver. And last but not least – Sony for making a wonderful, however very locked down, portable gaming handheld. I can install on a psp 6.39? They’re fundamentally the same. The 6.60 has the advantage of having CIPL for fully hackable PSPs that’ll allow them to have permanent installations. So, if I have PSP 3000 with data code 0C I can use PRO B-10 6.60 (its my OFW version) to install it? It’s LCFW untill I install permanent patch, am I right? Correct so far. However, there isn’t a permanent patch for 6.60. That’s only available for 6.20 PRO builds. 6.39 and 6.60 have CIPL for making it permanent on fully hackable PSPs (not PSP-3000s I’m afraid). And another question – can I install PRO-B10 LCFW directly from OFW 6.60? Shouldn’t I use any previous version of PRO-B (i.e. PRO-B9) and then install PRO-B10 (when I have PRO-B9 installed)? Nope, you can install the PRO-B10 build directly. No need for the earlier versions. i have a psp 1000 with 550 gen d3. can i upgrade to one of these? what should i do to be able to play ps1 and ps2 game on my psp? You won’t be able to play PS2 games, the PSP doesn’t have support for that (I wish it had it :/). For PS1 games, you can use EBOOT copies of PSX games. Either download them in said format or convert them. i have a psp 3000 6.39 Pro-B10, is there a version of CWCHEATS for my psp? Thank you for this useful info now that my PSP has been updated to the latest LCFW. I have a problem though in playing Shin Megami Tensei Persona as it won’t load when I start it. Any remedy on this. I have a special request. Can you put up a glossary where all the options in the PRO VSH MENU are defined? It would make a very useful reference. Thank you very much. I’ve 6.35 pro b2. Do I need to delete it first or just install pro b10 directly? wondering, I had my PSP updated with 6.20 PRO-B10, and i noticed that when i play a game, loading the saved gamed became corrupted. how come? Ok…..I looked at some nice feedback on this CFW….NOW! IS this ANY BETTER than 6.20 TN-D? The PRO builds have much compatibility with ISOs thanks to the inferno driver. 6.20 TN-D has you relying on the Prometheus ISO loader. So yes, it’s quite better. So…what. How do you load the ISO’s? Do you play them straight from the XMB or….what? if you place the ISOs in the ISO folder of your memmory stick, you can load them from the XMB. O.K. That’s all the info I need. Last, tell me more about the Inferno Driver. question mr, sylv3r i have 6.20 pro b6, when i changed the color of the background all the games ISO is gone! is there’s anyway to retrieve the ISO games? You probably just unloaded your LCFW.. Just run the fast recovery program on the XMB. Are there any requirements / restrictions I need to know before upgrading to 6.60 PRO B-10? Or should I just upgrade my PSP (or any PSP) to 6.60 OFW and then directly apply the PROupdater? I have a PSP 3000 with the original firmware 6.30, can I install the PRO-B10? And if it is indeed possible, can I make it permanent? Thanks guys ^^ sorry for the noob question! To install one of the LCFWs in the post, you need to be on the required OFW so you can either downgrade to 6.20 OFW or upgrade to 6.35 OFW, 6.39 OFW or 6.60. Also since you’re on a PSP-3000, the permanent patch will only work on 6.20 PRO-B10. I was afraid that I could need to have a diferent firmware installed like some 6.20 ME or something. I’ll try to downgrade to 6.20 to let it permanent then. And again, thanks for the help !! Haven’t tried. Anong DJ Max version ang gusto mo laruin. I have 6.35 PRO-B10. sir sylverblade anu na test nyo na? gumagana ba ung dj max? Wait, anong exact title ng game. Thanks sylv3rblade, it worked almost fine to me ^^ although I saw that mine PSP model was 9g so I didn’t try the 6.20 and used 6.60 ^^ but the CIPL_Flasher don’t work, do you know how to make it work? CIPL flasher won’t work because you have a PSP-3000. You’re lucky it didn’t work because it would’ve bricked your PSP. DJ max portable clazziquai edition ang tittle sir sylverblade!! kuya sylverblade hnd ba mag bbrick ung psp ko kung prom iso loader gmitin ko? Hinde pero mas compatible ang default ISO loader ng PRO-B10 kesa sa Prometheus ISO loader. may kailangan po ba akong baguhin sa settings ko pra malaru ko ung dj max? sir sylverblade bkt sa akin ayaw gumana ng dj max nag install n ako ng pro b10 !! may kailangan b akong ayusin sa setting or sa plugins? ung umd iso mode ba dpar nka inferno or sa config pa? or do i need to patch my dj max to play it ? Sadly you can’t make it permanent (thanks to the security measures that Sony has put into place). As for compatibility, the Pro LCFW has the inferno driver which makes it compatible with most games available. could you play kingdom hearts birth by sleep with this firmware PRO-B10?? can i make it permanent if i have 6.20 version of psp-3000 model? can i make it permanent if i have 6.20 version of psp-3000 model??? ok. anyways thnkx for the info. If aleady downloaded it, what will i put in my psp? The whole folder? Which mirror are you downloading from? I just have 2 questions. At the moment, I’ve got 6.20, and am using TN-E without a lot of problems – I’m trying to see the benefits of using this LCFW. If I have the umd of a game that requires a higher firmware than what I have, will this bypass the “you must update” screen? If not, and I have to update the a higher firmware and use the higher LCFW, is there anything keeping me from downgrading later? Depends on the game but since you’re pointing to UMDs, I’m say that 99.9% of the games in the market won’t give you that screen. That said, the only games that will give you a problem are upcoming games that are likely to ask for a new firmware. For PSN content, it’s a hit or miss thing, some older titles ask for newer firmware due to updates. As for upgrading/downgrading, it depends on your PSP model. Hmm, okie doke – thanks for replying. Well, I’ve got games like ZHP Unlosing ranger, YS: the oath in felgana, and i just got Tactics Ogre – all of these require 6.3X firmwares, and I never really noticed until the other day that my HEN doesn’t skip that update question [and i couldn’t seem to find any utils or anything that would do it either]. I’m not too concerned about psn content, I’m not a big digital purchases guy. I mean, i could copy the iso, and run that instead, but honestly i just don’t have the room on my cards. Just for closure – put it on, skips the update thing for games – I’m happy. hey, got a question. I’m all ready to update my PSP 1000 from 5.50 gen d3 to the latest 6.60 pro-b10, but will my save files from my old firmware still work? I’m a little hesitant if that’ll happen. thanks. There’s a small chance that the save files won’t work but there is a way for you to recover them if such a thing occurs. good to know 🙂 thanks for replying! If you have a 9g you can use the special downgrader to downgrade to 6.20 OFW and install 6.20 PRO-B10. The gotcha is that if your PSP gets updated above that without a special patch/upgrader, you’ll end-up bricking it. 2. the ISO folder is not in the root directory. yay! i did the second one.. i wonder why i go back putting the folder in the PSP folder.. THANKS sylv3r!!! What should I do to be able to upgrade to 6.60 PRO B-10? The easiest way to work around is to download the 5.50 GEN-D3 updater, and flash 5.50 OFW. After that you can update to 6.60 OFW. Hi sylv3rblade i have PSP 6.60 3000 9g ,ask ko lang po if may conflict kapag nag update ako sa Pro-B10 kasi po right now nka Pro-b9 at LME 1.6 ako balak ko mag update to B10..ask ko po if may conflict bka kasi may issue na ganun gusto ko lang po makasiguro ok xa bago ko i update thanks.. and direct install pa rin po ba ko kapag nag update ako? ?follow ko lang yun instruction mo dito sa taas? ?no need na ko mag uninstall kasi di naman ako nakaperma right?? ?thanks in advance.. There is a slight risk of bricking when using the perma-patch, that’s the reason you see that warning :). 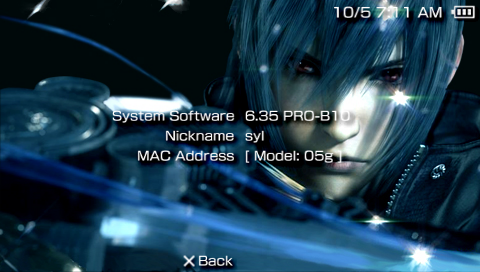 For reference I have a PSP GO as well but it’s on 6.35 PRO-B10. The instructions are indicated in the post on how to install LCFW so you can play downloaded copies of games. Hi,my psp have original 6.20 software,do i need pandora battery or i do whit download first 6.20 OFW or 6.20 PRO-B10? You don’t need a Pandora Battery. Since you’re already on 6.20 OFW just download 6.20 PRO-B10. Sorry to bother you again, but you said to that to download this I’ll need to move from 6.60 LME to 6.60 OFW but while I was doing so there was a notification on my PSP saying that I didn’t need to upgrade because I already have the latest build. So I’m still stuck on my LME build. hi, i would just like to know which would you prefer for a PSP 1001 v.3.73 thanks. sir, ask ko lng pano gamitin ung CIPL_flasher? pina copy nyo lng ung proupdate at fastrecovery. pero ang nagamit lng eh ung proupdate. sorry noob po. Before trying to run CIPL, sure ka na hackable yung PSP mo? I have 6.20 PRO-B5, how do I update to B10fix1? thank you so much for the link! now i get to play my ISO files again! thank you!!! I have a PSP 2004 Slim and lite and the code is 7c, I have OFW 6.60 installed on it. is there any custom firmware for that? which one would you recommend? Are your games in ISO format and in the proper folder? Do I need a pandora battery and magic memory stick to psp if I have 6.60 ofw? i have a 3001 v.6.60 do i need the pro to download free games without a computer bc i cant find any games or working websites. psp.gdteam.net doesnt work for me. would pro help? I have a psp-3001 that has a little c after the 1. The S/N is HU6837367. To convert to CFW is the best way to get a stable custom firmware is to upgrade to 6.60, then use 6.60 pro-b10? Sylv3rblade…. You still around? I have a psp-3001 that has a little c after the 1. The S/N is HU6837367. To convert to CFW is the best way to get a stable custom firmware is to upgrade to 6.60, then use 6.60 pro-b10… or what are my other options? What is your current firmware version? You do not need to upgrade to 6.60 if you have 6.20, 6.35 or 6.39 OFW. So, once I download 6.60 PRO-B10 and place it’s files in the correct location, do i need to install anything else to play ISO PSP game files that I have on my PSP in the Games folder? I have a psp 2000, running 5.03 prome-4, its not fully hackable so i was wondering if I can still upgrade to pro? Hi, a NOOB here so bear me for a moment. I have gone through the above comments and got some doubts. I hope u dont mind clearing my doubts. 1. My PSP is 3004 v 6.6 now what is this 1g,2g etc and how to find it for my PSP ? 2. Can my PSP be hacked permanently ? 2.1 If it is temporary what procedure should i follow to keep it permanent ? 2.2 if the Light Custom Firmware works fine on my PSP, will i be able to play games downloaded from the internet ? 2.3 and does that mean after shutting it (PSP) down all my data will be erased ? 3. Will there be any permanent patch for my PSP in near future ? i mean is it possible or not to hack it permanently in near future ? 4. And finally most important question what are the chances of my PSP becoming another piece of useless junk if I follow this procedure ? please answer these questions and thanks in advance !!! waiting for your fast reply !! As I see, you didn’t get anwser so far, so I’l try to help you. 1. I don’t know anwser for this question, but as far as I know, it doesn’t matter which version you have. 2. Again, as far as I know PSP 3004 is not fully hackable, and even if it’s somehow possible there is a risk of bricking you console. 2.2 Yes, you will be able to play .iso and .cso backups. 2.3 No, none of the data on your memory card will be erased. Because it’s called “Light” Custom Firmware, you will have to run “Fast Recovery” file every time after you will turn on PSP. When you will do it, console will start again and from now on you will have custom firmware again. Also .iso and .cso games will be visible and able to play. All procedure will take around 30-45 sec every time, so it’s not worth to risk brick for permanent patch. The games and save states will not be erased even if you will turn off your PSP. 3. For now it’s propably not possible. I hope it helps. I had similar problem like you, and I got anwsers here more that one year ago. Greets! As a precendent, you can follow my CFW for Dummies for the PSP to learn the basics of custom firmwares, terms used by the community, etc for your PSP. 2. Short answer no. Long answer, there’s a pseudo hack that makes the cfw permanent but it only works on 6.2x and lower firmware and only on older PSP-3000 models. Thanks a lot !! now I will try to install this LFCW on my PSP !! hey there! if i have psp3000 6.20 hen TN-E (ta-093), should i just download the 6.20 pro b10 and proceed with the instructions? would there be any chances of bricking my psp? thanks! i love the site btw, it helped and still helping me a lot! Yep you can overwrite your TN-E with the PRO-B10 installation. Yes there’s a slight chance of bricking but that’s only if you have anything else accessing the flash0 of your PSP, other than that you’re safe. thanks for the prompt reply! im sorry but another very noob question, how will i know if there’s anything else accessing the flash0 of my psp? Hi. So I’ve just upgraded my PSP from 5.50 gen-d3 to 6.60 pro-b10. I put my ISOs into my PSP ISO folder as usual and I could see their icons on my games menu from my PSP. So I try to run the games but after the PSP logo, it just black screened and I had to take my battery out in order to turn off my PSP. What should I do? Please help! Press select and check the ISO mode that your PSP is currently on. So I pressed select and found out that there were three options for the UMD ISO MODE, inferno, M33 driver and Sony NP9660. I tried to start the game with all three, but none of them worked. It just black screened and I had to take out the battery again. What should I do? Okay A little help here… I haven’t been playing my psp for like 4 months and after all that I felt like wanting to play it again. The CFW that it is currently using is 6.60 PRO B10 and it is a PSP3006 model. I really haven’t had problems with my console until I opened it after four months. I googled up if people had the exact same problems like mine and found out that they do. Some have theirs fixed easily because their models were a PSP 1000 or 2000 and use recovery menus from older CFW. What they do is holding R and I even followed an instruction in youtube videos and sites like psp slim hacks the psp community, wololo talk and advised button combinations like press start select square triangle or start select square x or the same combinations just adding the home button and holding them while rebooting the psp. I tried everything and nothing happened.